Stuntin’ Is a Habit | I'm Skinny, Now What? You developed those habits so long ago they’re part of you. What I’ve found on my weight-loss journey is that making your good habits a part of you is key to meeting your goals. And it took much longer than 21 days for that to happen. It’s not called a lifestyle change for nothing. Making this lifestyle a part of the very fabric of your nature takes a lot courage. It’s easy to stay comfortable in your routine. Eating, sleeping and working are so much a part of you that you don’t realize you’re doing them any more. The same can happen for you when you’ve developed a routine with diet and exercise. Here are a few ways to make sure your good choices become habit forming. 1. Set a schedule. A plan of action is a great first step toward meeting your goal. If you work a regular 9-to-5, then you’re better off than some freelancers. You know when you need to get up, when you need to get to work, when you get off and how much time you have left over in the day. You know how long it takes to get ready in the morning, how long it takes you to get to work and how to bypass traffic on the way home. That means you know where the pockets of time are for meal preparation, workouts and rest. 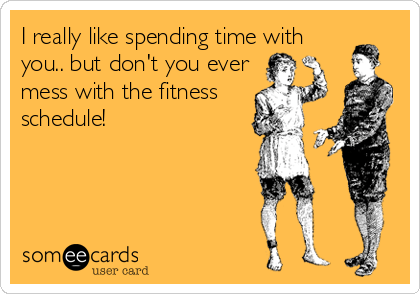 Those of you without a set schedule are going to have to let life work its way into your weight-loss plan. You may need to first set your meal prep, workouts and rest times and let the rest of your day fit in as needed. 2. Plan your meals. Rest day is the best day for meal prep. You’re not overly exhausted from the hurting you put on your body in your workout. You’ve got time to really take inventory of what you have in your cabinets and what you may be in the mood for during the week. You have time to glance through your cookbooks and see what new recipes will work for you this week. And you have time to browse the grocery store instead of a rush job where you forget things. You may find a nice piece of fish on sale you can broil later. All of this is to say having your meals (especially lunch) ready saves so much time when you’re getting ready to leave for the day. 4. Understand there are 24 hours in a day. So you’ve set your schedule and you’ve planned your meals. But life happened, and you overslept and missed your morning Zumba class. Someone at work ate your sandwich, so now you don’t have anything to eat. So what? There’s still time later in the day to burn a few calories. You may not be able to make it to the gym, but you can surely find a way to get moving around the house. Or you could take a long walk at lunch. Or you could to any number of things that you were supposed to do anyway. We all share the same time clock, and yours says there’s still time to get it in before the day is over. 5. Don’t accept failure as an option. Simply put: if where you are isn’t where you want to be, do what you have to do to get there. These good habits will become less and less stressful the more you do them. But you’ll be so pleased with yourself when you accomplish your goal. What habits have you picked up or broken since you began your weight-loss journey? I constantly need to remind myself of number 4. With my health and fitness goals, my brain seems to automatically take an all-or-nothing approach. If I eat something less healthy in the morning, I somehow convince myself that the day is already a loss and don’t make consciously healthy choices the rest of the day. If I miss a workout, I’ll end up sitting on the couch all evening. It’s bizarre because I don’t do that with anything else in my life. If I’m running ten minutes late to work, I still go to work. If I don’t get to take my kid to the park because it’s raining, I still find time to play with her in the house. Exactly! You find alternatives when you can. It can be difficult, but anything worth having will be.